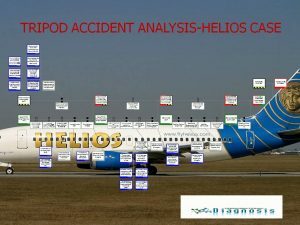 In Organisational Diagnosis, we are experts into applying TRIPOD Beta methodology while investigating a systemic accident in high-risk industries like Aviation, Maritime, Oil & Gas, Financial Sector, Defence, Rail & Transport, Energy, Health Care etc, and understanding the safety culture mixture of the organisation/ons involved into the accident. TRIPOD Beta methodology then can be used not only so as to realising the effectiveness of existing barriers and defining problematic areas of operation but also to understanding the limiting thoughts(preconditions) that prevented the specific culture to have previously imported into its SMS all necessary barriers to prevent the accident from happening. In the Advance Workshop in TRIPOD Accident Analysis, the scope is to extend the investigation further down to defining the underlying causes of any accident and relate them with the 11 Basic Risk Factors and their categorisation. By proceeding to work with BRFs it will finally lead us to draw more strategically useful conclusions from accidents and we may also obtain a method to portray overall safety performance. The second topic within the advanced TRIPOD course relates preconditions with the structuring of safety cultures of organisations involved into any accident. By working further with the limiting thoughts that prevent humans at the sharp ends of accidents to act as required, the investigation unveils problematic areas of existing safety culture, an area to work in the proactive side of dealing with safety. Advanced TRIPOD BETA Accident Analysis Workshop requires as a prerequisite trainees to have done our Basic TRIPOD BETA Accident Analysis Workshop before. Alternatively both Courses can be done in a 5 days Combined Course. Therefore, we propose a 2 Days Training (16 hours) to address the new concepts and trainees be in a position to cope with the new tasks that go with the new Course. Training can further be customised not only in line with the Industry it needs address, but also to include specific accidents-case studies, and comment in specific areas of interest, upon request.